Head for the hills. Naot’s ‘Lappland’ sandal is rugged and ready for action in the great outdoors. The uppers are hand-sewn of sturdy genuine leather for incredible durability. Both the front and the quarter strap feature hidden Velcro brand closures for complete adjustability; the addition of an ankle strap enhances stability when you’re on the move. And the layered contour footbed assures superb support and comfort for whatever activity you choose. Bought my first pair in a small shop in LaJolla about 10 years ago...just replaced them with anew pair from Dodds whose service was excellent. 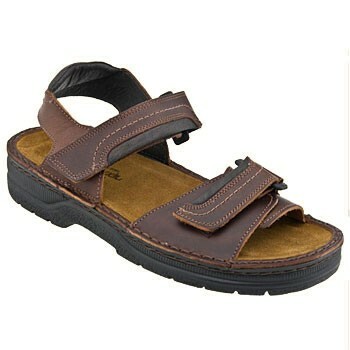 Having reached the age of 80, my feet are ever thanking me for my new sandals...so very comfortable. THANKS Dodds Shoe and Naot for the Lappland sandal! I've been wearing these sandals for about 10 years. I absolutely love them. People complain that the quality has gone down over the years but I have not noticed. I will be sad if they ever discontinue the Lappland Buffalo.